With the distractions of Summer and Spring, the Hahnville Softball squad still managed to secure their place in the district playoffs. 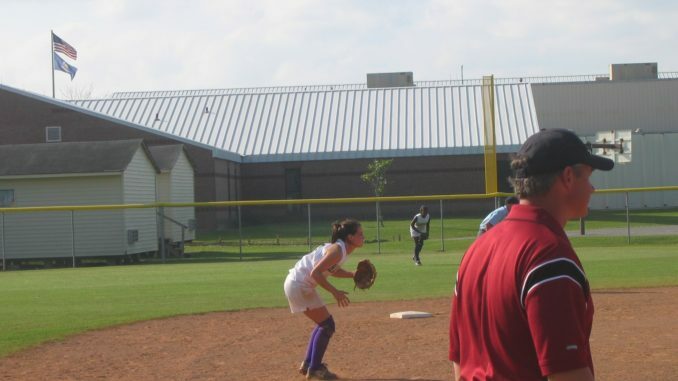 “One challenge that faces me as a coach is keeping the kids focused on softball when Spring is here and it brings on many other activities that seem to take precedent over winning games,” said Kenneth Vial, Hahnville’s Head Coach. “We had seven starters return this season, Meghan Vial, Chelsey Flores, Gina Sierra, Ariel Romero, Annie Minnich, Lela Clowers and Dara Fontenot,” said Vial. With that much talent returning to the team and standout players such as Annie Minnich, two time All-District shortstop, the softball team should give the opposing teams a run for their money in the playoffs. “New comers, Jia Bridges and Jessica Concienne, are freshman that can be counted on to provide offensive punch,” Vial said. He went on to say, “Kelli Wells has become a strong player. She has stepped up and wants to hit.” The team’s strength is defense and they rarely hurt their side with errors. “Our trademark would be consistency on defense,” said the head coach. “My philosophy for coaching is ‘control what you can control’. Play the game by doing what we are capable of doing and don’t do things that other people do if we don’t have the capabilities. Be optimistic about what the players can and can’t do. I never ask for too much,” says Coach Vial. The team consistently aims to make the playoffs. As of now the team stands at 23 and 10 with losses including Vanderbilt Catholic High School. “The team’s win loss record doesn’t matter, the tournament is much more important,” he continued. “I aways tell my players that nothing matters except the playoffs. We make it our yearly goal. We play the best everytime we can, I don’t want to play anyone who can’t beat us, and that makes us better in the end,” Vial stated. “The players are very experienced. We have played together for seven years. We know each other and the game. Execution is the key,” said Vial. The coach says that being a good softball player is putting in the time and effort to perfect the individual player’s game. “I encourage the players to do weights, conditioning, summer ball and practice. The regiment can be very demanding,” said Vial. The team is fortunate to have seven returning starters and a freshman stand out player like Minnich. “There are usually very few seniors on high school rosters. Only about 30 percent of freshman starters become senior softball players,” Vial stated. With determined players and a team full of talent, all eyes will be on the softball playoffs as HHS attempts to secure the district title.